05 Apr Trepidation as we head into seeding. After such a terrible year there is a sense of trepidation as we move into the Australian seeding period. 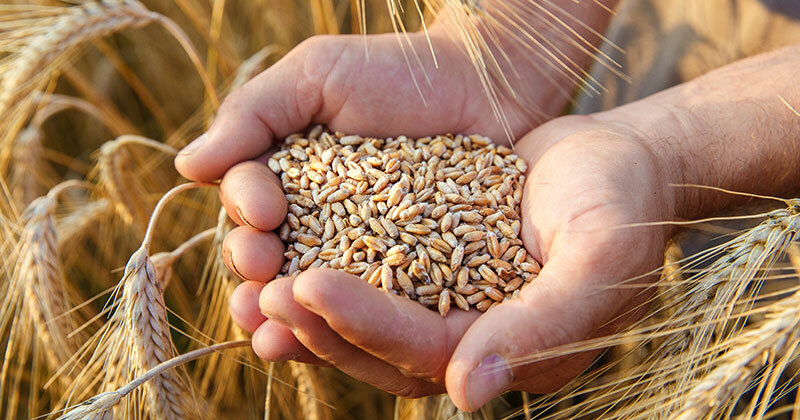 In this week’s grain comment we take a look into ASX pricing and the ramping up of volatility in pricing. The Chicago futures market has traded in quite a narrow range over the past fortnight, between a high of A$258 and 251. The floods throughout the USA have seemingly been the worst on record, however, there hasn’t been much of a reaction in the markets. The market could see surprises over the next couple of weeks as damage is assessed. There was substantial rainfall across much of Queensland, however it wasn’t quite as beneficial for NSW as expected. The local futures market (ASX) fell late last week, and into the start of this week. The lower than expected rainfall has resulted in the market rallying A$8 (figure 1). There has also been some decent volume on 2021. At present producers on the east coast can use ASX futures to lock in prices above $300 for the next two years. 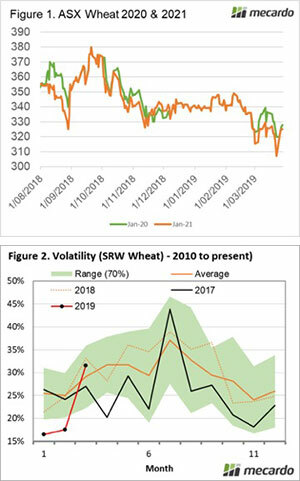 In January I discussed volatility in the wheat market. At that point in time volatility well below the bottom of the expected range for the time of year. This lack of volatility continued through February, however March has seen this spike (figure 2). As we get close to the northern hemisphere harvest we will likely see volatility increase. Typically, July is the most volatile time for the wheat market. If you think Australian politics is a mess, look at the UK. Today was expected to be the day that the UK left the European Union. However there has been a kerfuffle over the process. This has caused a huge amount of uncertainty with no-one knowing when or if the UK will leave and how it will be done. The Prime Minister has even announced that she will quit, provided that the parliament votes for her deal with the EU. As we get close to the new marketing season, the market will be examining planting and export figures. Russia has been the most important global exporter in recent years, and the ag ministry is calling for another large crop. However the IGC see global stocks declining at the end of this season as consumption rises.